Raymond Charles Halliburton was born on May 2, 1930 in Shattuck, OK, to James Raymond and (Lillian) Pearl Ashpaugh Halliburton. Raymond moved to Beaver County with his parents from north of Arnett when he was five years old. They rented the Austin place, as it was called, and lived in the big house. They later bought the Malone place where they lived for the rest of their lives. Raymond went to Glendale Country School for all his education, leaving school after eighth grade to help his dad provide for the family on the farm. Even so, his knowledge and math skills always amazed his children as he helped them with their homework. Algebra and geometry were a breeze for him. They were also amazed by his inventions and by his ability to remember people and details. On February 24, 1948, Raymond and Thelma Treat were married at Beaver, OK. To this marriage, three children were born--Charles , Deanna and Randy. On March 4, 1976, he married Carole (Hurst) Buss and added Sandy and Debi to his family. Raymond farmed and raised cattle in Beaver County all his life but cattle was his main interest. He loved driving his pickup and looking after his livestock. He and Carole named many of their cows and calves and spent hours watching them and letting them eat cake out of their hands. They loved their country lifestyle and enjoyed sharing it with the grandchildren and later great grandchildren. 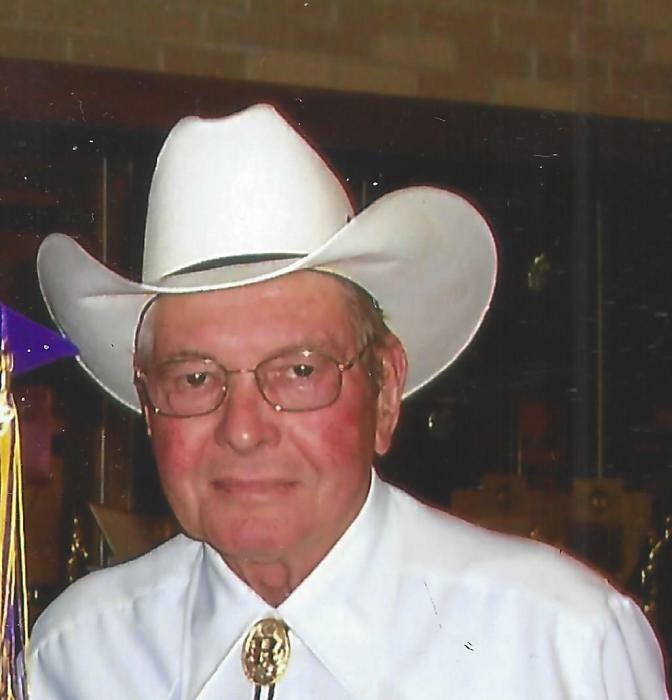 Raymond worked for McGuire Feed Yard in the 1970's and loved to tell stories of his many adventures hauling cattle. Maybe he just loved telling stories but trucking provided a lot of interesting material to add. He worked for Beaver County from 1986 to 1996 and retired from there to devote all his time to his cattle business. On October 30th, 2008 Carole was taken from him after a short fight with cancer. On November 14, 2009, Raymond married Coeta Sperry, spending nearly nine years enjoying the gift God sent to him. Raymond told anyone who would listen, "Coeta and I never had a harsh word between us." They enjoyed their golden years to the fullest even through their declining health. Coeta died suddenly on August 3, 2018. Raymond said he would never get over it. He joined her in Heaven five months and eleven days later, surrounded by the loving staff of the Beaver County Nursing Home. Also proceeding him in death were his parents Jamie and Pearl Halliburton, baby brother Harold Duane Halliburton, sister Joann Cantwell, sister Dorothy Woolley and her husband (and Raymond's best friend since grade school) Walter Woolley. Surviving him are his children, Charles Halliburton of Tulsa, OK, Deanna Laverty and husband Curtis of Slapout, Randy Halliburton and wife Lea Ann of Slapout, step-daughters Sandy Purcell and Debi Kovarik both of May, OK, sister Patsy Carr of Pampa, TX., seven grandchildren, seven step-grandchildren, numerous great-grandchildren, one great-great-granddaughter and six nieces and nephews that he thought the world of.